The winners: #1 Beach(es), #2 Bird(s), #3 Data. As a group, COASSTers spend thousands of hours a year completing their COASST surveys and thousands more traveling to their COASST beach(es). We just had to ask: what keeps them going? Why continue month after month? Well, it happens that we asked this very question on the COASSTer survey in April 2012, “tell us why you continue to be involved with this program” and we let all of you free-write, to explain. Using just the nouns, we ran the words through Wordle, a program that takes a bunch of text and creates these types of word collages, where the font size reflects how often a particular word is used. There’s actually one on the right side of our blog, but it’s based on a few “tags” we set a-priori. 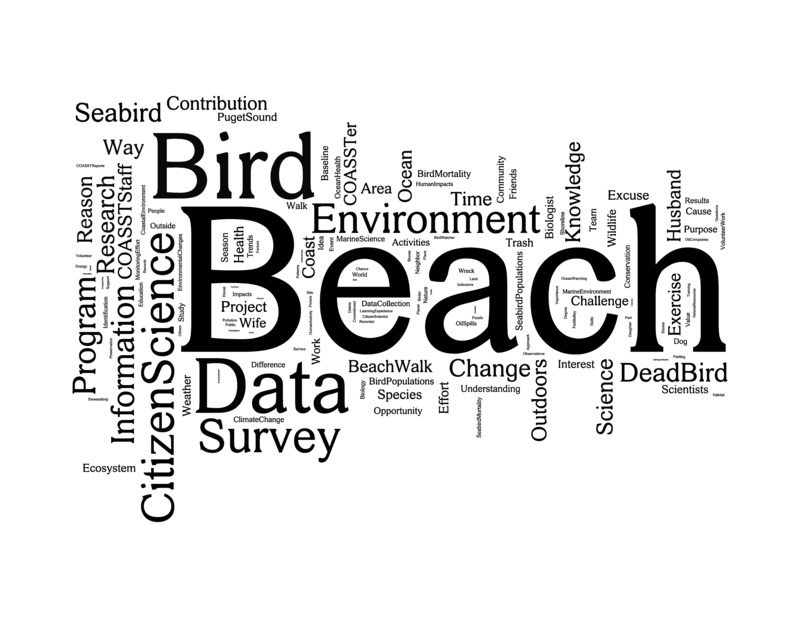 For COASST participants, there’s a clear winner: beach (merged here with the plural: beaches). That’s an association with the where of COASST. And secondarily, bird (includes, again: birds). That’s the what of COASST. You can also see some of the who of COASST, which has many more unique forms, “husband” “COASSTer” and “COASST Staff” among them. “I even like some of the small words, ‘excuse,’ ‘wife,’ ‘stories,’ ‘puzzle,'” writes Julia. This entry was posted in Uncategorized and tagged Citizen Science, Volunteer on 23. July 2013 by coasst.